How do you know if your chickens have Red Mite problems? You will notice two things; firstly your egg production will start to go down as the chickens need to replace the lost blood taken by the Red Mites (which means less energy to produce eggs), and secondly the chickens will start to peck each other where they see the infestation - usually just at the base of the tail feathers. At this point the problem is likely to be causing stress and is getting serious. Keep a close eye out for any pecking behaviour, and also any bald, bloody patches on your birds. 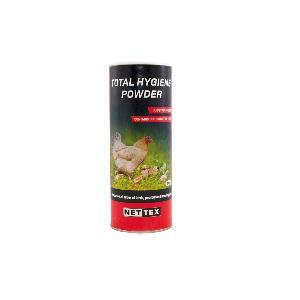 Total Hygiene Powder with Diatomaceous Earth is a natural mite control powder that can be applied directly onto all types of birds and poultry. Red mites, depluming mites, northern, cyst and spider mites, plus other insects such as cockroaches, ants, silverfish, termites and fleas, and lice and ticks commonly associated with domestic pets are all susceptible. Apply in the nest box and on top of bedding as it is an effective way of applying powder to the hens underside when they set down to lay. Repeat weekly when cleaning out the house. Mite powder may also be mixed with wood ash in the dust bath, which should be in a covered area of the run.